Stan Musial gets the Joe Posnanski (TBSWIA) treatment. It is well done, as always. Rick Ankiel version 2.0? 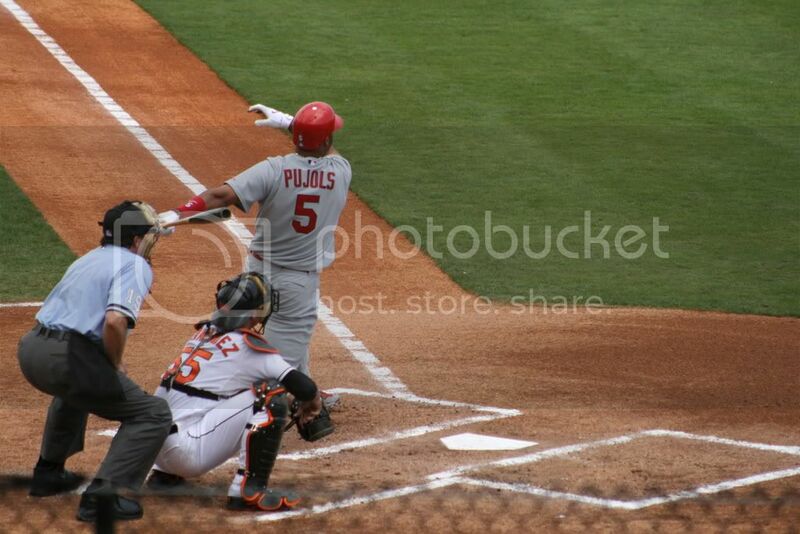 I saw Adam Loewen pitch in Spring Training and he was lobbing up meatballs to the Cardinals (in fact, this picture I took of Albert Pujols crushing a homer off of him is the wallpaper on my computer). One of the great arguments in baseball is about who deserves to be in the Hall of Fame. I am of the opinion that the Hall of Fame should be reserved for the greatest of the great and guys like Gary Carter, Bruce Sutter, Andre Dawson and Jim Rice (two in, two not in, but get a lot of support) should be left out. Dawson and Rice were great, but were they really in the same conversation as Mays and Musial? Anway, this post looks into the job that the BBWAA has done in electing Hall of Famers. Speaking of starting arguments, SkyKing lists who he believes are the top ten best position players in baseball. He's got a method to his madness, although he admits that it isn't 100% scientific. A few years ago it was thought that Rocco Baldelli would be leading the Rays to the top of the AL East. The Rays have made it, but Baldelli hasn't quite. This is a somewhat sad story, but it still may have a happy ending. Jon Heyman gives his latest trade rumors/speculation (including one about Ray Durham that is now dated).